Love the handles! - I love this kitchen can you please let me know where I can source the handles and knobs. Many thanks,..
Cabinetry - Hi would you be able to kindly share what the height to the top surface of the stone bench top is in this laundry and what height is the kicker board down the bottom? Thanks so much. Hi lisa2chang, the benchtop is 60mm thick, with the surface at 910mm from the ground (standard height for average person). Kicks are 100mm high (again standard height). Cabinetry - Hello. Is the cabinet in 2 pack Satin finish? Thank you. Beautiful work! You are correct. It was painted in our very own manufacturing facility. I don't have our plans of the project in front of me, but judging from the image we can say the cabinet depth on either side is around 0.7m and the aisle is approx. 1m wide. The length of the room is around 3.2m. Flooring was by the builder. I can tell you it is a high-end travertine tile. Hi @natski17, it is Caesarstone Mink 4350. 60mm Mitered edges. How do you support the washing machine as it can shake and move? Hi again Natasha. I can certainly help you here. The Miele washing machine and dryer are very heavy, and if leveled probably, will not vibrate or move. They are excellent appliances. The surrounding cabinets are made to be incredibly rigid, easily supporting the appliance's weight and absorbing any vibration. Hi lullaby23, I've listed it as Travertine, but keep in mind not all travertines are alike. If you have a laundry space already that has direct access to the outdoors, you can convert this to a multipurpose space that can also act as this transition zone. Even if you want to keep your front entrance for visitors, you can tell family members, especially dirty ones, that they have to use the back door. 2. … And your appliancesBenches aren’t the only things that could do with a raise – front- loading appliances benefit from a lift to save you from crouching uncomfortably at floor level when loading and unloading them. Some newer front loaders have drums that are positioned higher in the machine’s frame. 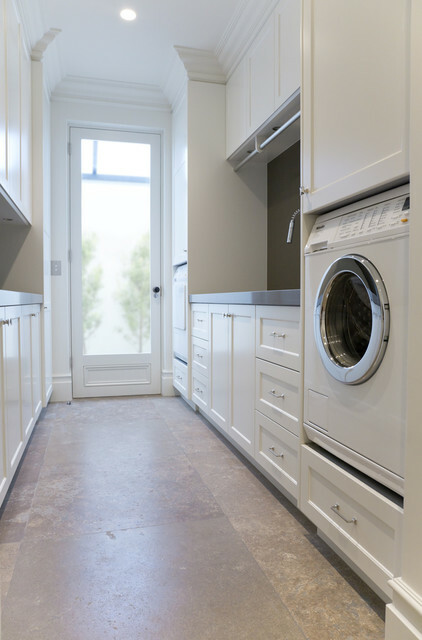 Generally, 750 to 1000 millimetres is a comfortable height.In this galley-style laundry in Double Bay, Sydney, Dan Kitchens Australia has cleverly raised the Miele washing machine and dryer off the floor by integrating them into the joinery. Tip: To let the sun and wind do the drying for you, include a door leading directly outside from your laundry, as has been done here. Tip 13: Bring in the natural light Install a panel of glass in your laundry door, or expansive glass windows, to allow natural light into your laundry for a healthier environment. As well as saving on electricity bills and saving energy, natural light improves your mood and productivity. The glass door in this heritage home in Sydney’s Double Bay floods the room with light and allows easy access to a courtyard and a clothesline. Hanger rack in laundry room... does it make sense to combine laundry and mud rooms? Cabinetry and hangers for clothes.